Christmas weather (kind of) and Miso! Not sure what happened to Summer over here in the land down under, but it seems to have made it self very scarce as of late. Yes, it’s actually looking a lot more like Christmas around here than I initially expected. The warm summer breezes have been swapped for cool windy temperatures with lots of rain. And while it isn’t quite the right form of precipitation falling from the sky for a White Christmas, it is consistent and unforgiving. Mostly when you’re walking to and from work and especialllllly when you’re carrying one too many bags, as I normally am for some reason unbeknownst to me. Anyway, I have a feeling I jinxed things with my complaints about the hot wind. And maybe also when I was writing Christmas cards and declaring how much I missed the winter. Ooops. No matter, I can deal with a bit of wet weather and a cooler climate for a while. It makes drinking tea SO desirable and it gives me more excuses to bake and also make soup. SOUP! Miso Soup that is. I only recently acquired a taste for Japanese food. Seaweed used to completely turn me off. The smell still does a bit, but I’m really getting into vegetable sushi and miso soup seemed like a great idea last week. And let me tell you, it was. Either way, I enjoyed it thoroughly. Whatever else you have on hand that seems appropriate or not appropriate. Or any vegetable ever. Bring the broth and water to a boil in a large saucepan and add the wakame. Allow to simmer for 5 minutes or until it is soft. Remove the wakame and chop into much smaller pieces. Add the onion and carrots to the broth and boil until tender. 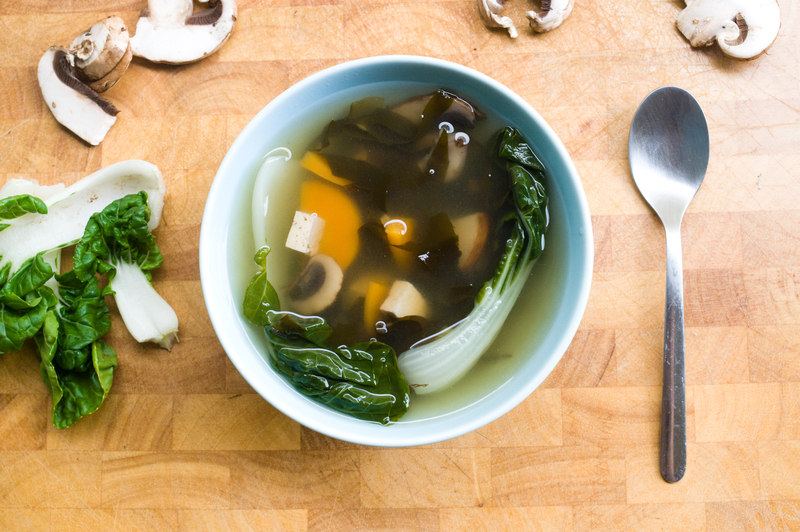 Add the mushrooms, tofu and wakame to the broth and simmer for another 10 minutes. Right before serving, add the bok choy for a couple minutes until just wilted. Take a spoonful of broth and add 1 tbsp of miso. 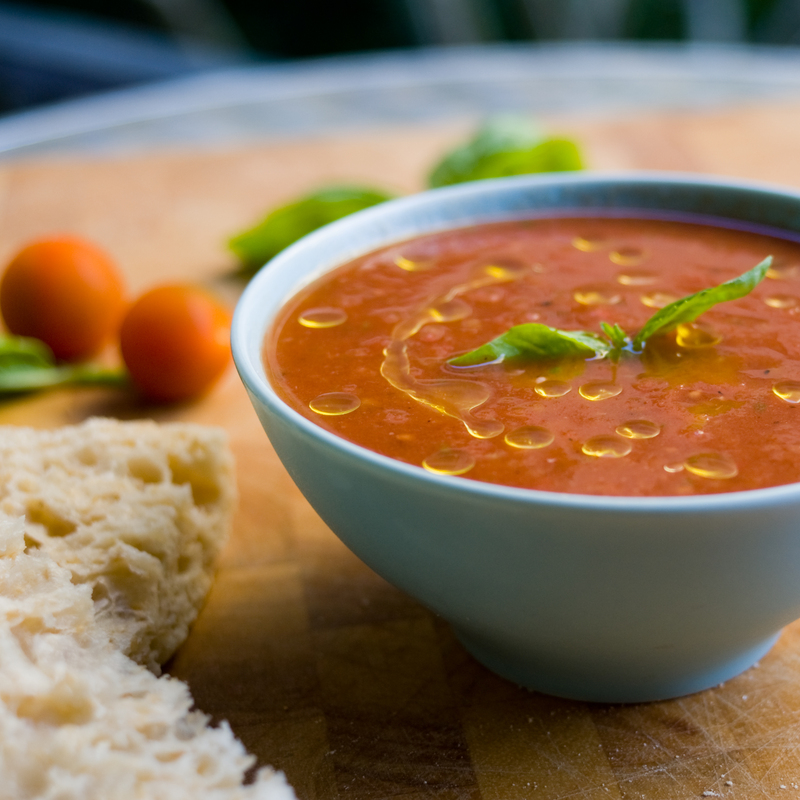 Whisk it up until combined and then fill the rest of the bowl with soup. I add the miso to each bowl, as it should not be boiled. 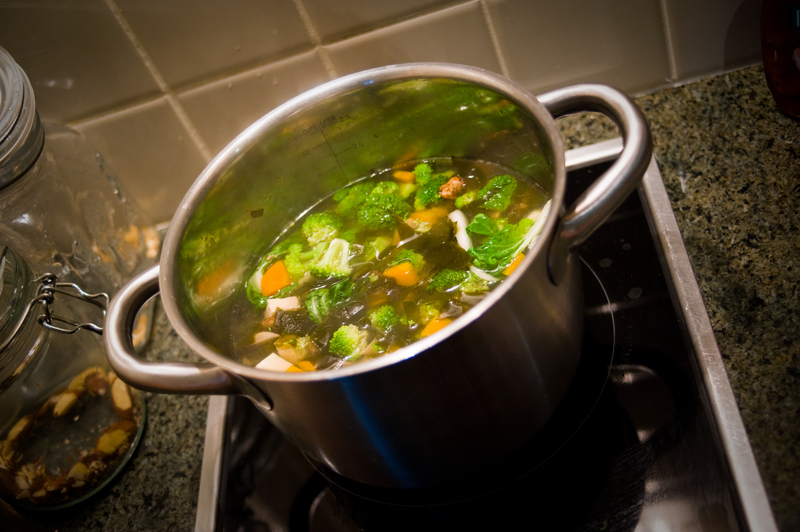 You can add it to the pot if you intend to eat all the soup at once, otherwise just add it per bowl. Adjust to your taste. I used a very light miso in this recipe, so it wasn’t a strong flavour, but I enjoyed it. You can use whatever type of miso you prefer. I’ve talked at length about my cravings for summer. About the warm breeze, about summer dresses, about the decline of banana prices. Yes… these are things I love and crave. And over the last couple weeks, my cravings have been satisfied. Banana’s are dropping in price, summer dresses are a plenty and that warm breeze is finally upon me. But then, how quickly I change my tune. The bananas and summer dresses are still amazing, don’t get me wrong, I would buy more if I could. Alas, my wallet can’t handle it at the moment. However, I’d like to have some words with that breeze. THAT BREEZE. Not really a warm breeze anymore. It’s a hot burst of air that almost makes you wish the air was still. On my way home from work today I got blasted with the hottest breeze I have ever encountered. I kid you not. 32 degrees may not seem overly warm, but for some reason it hit me like a ton of bricks. A ton of very hot bricks. And I’ve been told this is ‘the most comfortable part of summer.’ I’m in for temperatures reaching 40 degrees celsius. Oi. I’m going to say that the main street I was walking along that was currently experiencing some gridlock like rush hour traffic was partly to blame. Every time a bus drove past me it was like walking into a wall of even hotter air. I reckon it would have actually been quite lovely near the water. Probably quite comfortable. I’ll have to find a more roundabout route of walking home that takes me on a waterfront tour. In any case, I’m not going to complain about it. Only good things come from having warm days. Good things that I will compile in a list. 1. I don’t have to wear a jacket to work. 2. When you run, you sweat ninety-times more, and though you may feel like barfing once or twice, you also feel ninety times more productive afterwards. I will add to this list as I see fit. But for now, let’s settle on numero 3. GAZPACHO! I made this delicious chilled soup for the very first time. For some reason I actually thought you were supposed to roast everything and THEN blend it… and THEN chill it. But no, you just blend it all up raw. WHAT?! Delicious and so nutritious. Really, so much less labour intensive than I had imagined, and just as good. 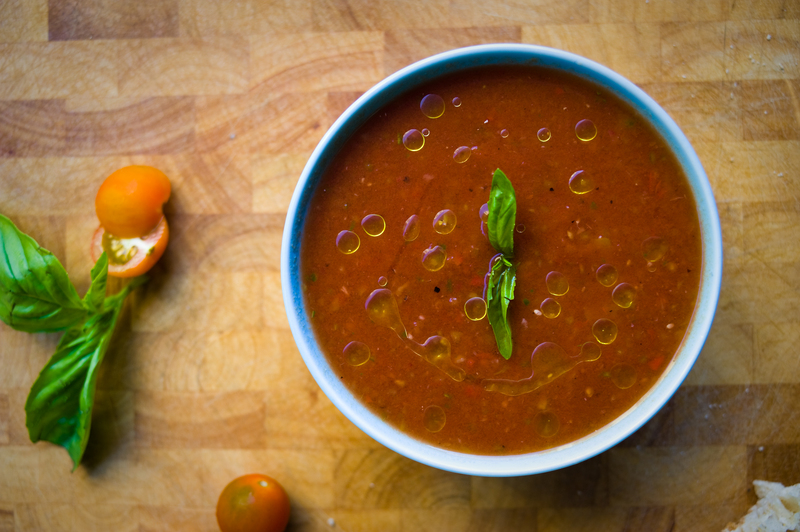 I’m a fan of eating pasta sauce with no pasta and biting into a raw tomato as if it was an apple… so GAZPACHO! was (and is) right up my alley. So refreshing and so delicious served with avocado and some toasted pita chips. 1. Throw the veggies and juice in a bowl with the olive oil. Blend and blend and blend. 2. Add balsamic, lime juice and salt & pepper to taste. Mix. 3. Chill. Top with basil, olive oil. Eat.